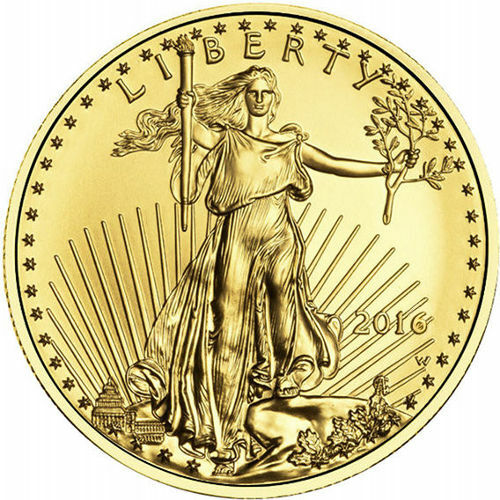 One of the nation’s most popular coin programs is the Gold American Eagle. Produced at the United States Mint, the bullion version of the coin is the official gold bullion product of the United States. Its weight and purity are guaranteed by the US government, making it an extremely popular choice among investors. Today, Silver.com is proud to offer the 2016 1/10 oz Gold American Eagle coin in BU condition. Ships in protective plastic flips or mint tubes of 50 coins. Features actual gold content of 1/10 troy ounces. Face value of $5 (USD) is fully backed by the US government. Bears Augustus Saint-Gaudens’ Lady Liberty design. Miley Busiek’s bald eagle depiction graces the reverse. In 1905, President Theodore Roosevelt tapped Irish-American artist and sculptor Augustus Saint-Gaudens to help him revitalize the design of the nation’s gold coinage. Saint-Gaudens created numerous designs for various US coins, but the most famous was his $20 Gold Double Eagle design. Debuting in 1907 on the aforementioned coin, his image of Lady Liberty depicted her in full stride as she walked into an unknown future with confidence. With the setting sun at her back, Liberty departed the capital city of America with a torch in her right hand to guide the way, and an olive branch in her left to symbolize peace. 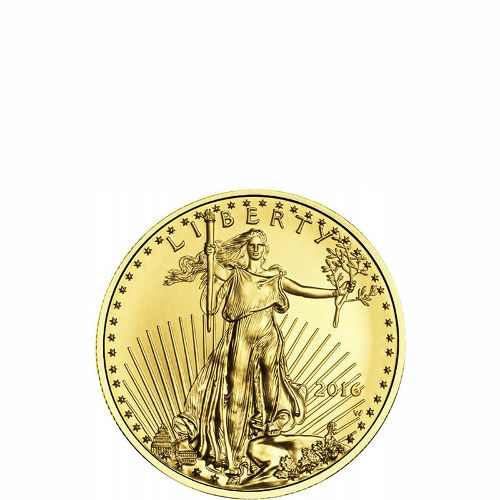 On the obverse side of each Gold American Eagle is Saint-Gaudens’ depiction. His original design required updating for use on the Gold American Eagle. The original Lady Liberty design was encircled by just 46 stars, representing the number of states at the time. The coins now bears 50 stars to represent all of the current states. The reverse bears the image of a family of nesting bald eagles. Created by Miley Busiek in 1986, this image is an exclusive design for the Gold American Eagle coin series. Busiek is a nationally recognized sculptor who has worked with the United States Department of the Treasury, Department of Defense, and Bureau of Engraving and Printing, among others. 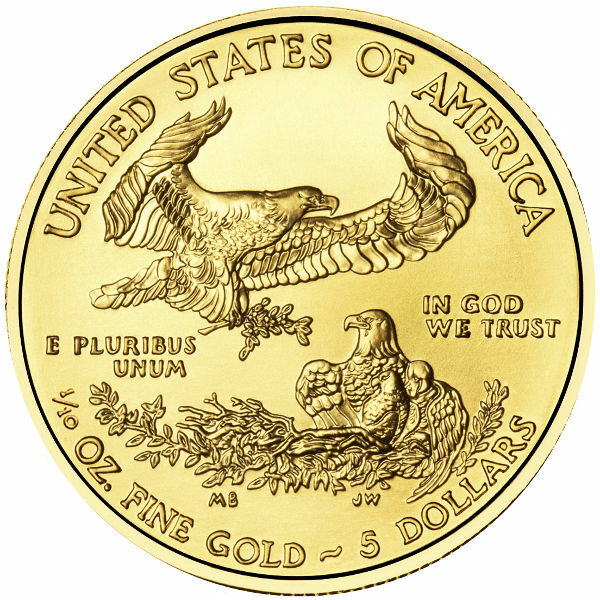 All Gold American Eagle bullion coins are produced at the United States Mint’s West Point Mint facility. These particular coins are Brilliant Uncirculated products, indicating a lack of wear and tear. Please don’t hesitate to contact Silver.com with questions. You can reach us at 888-989-7223, connect with us online using our live chat, or submit your questions via email.